Being Transcribed by Clifford Arnoux The negotiations in this latest dispute led to an improved citizen complaint process, agreement on more equitable delivery of services to the black community, but perhaps most importantly to creation of a biracial task force which will continue to work on law enforcement problems. Four committees were established indicating the task force's main areas of concern: firearms policy, citizen complaints, police recruitment, and police-school liaison. A country grand jury indicated a deputy sheriff on involuntary manslaughter charges in the death of the man who jailed. However, that officer was eventually found not guilty. That officer was eventually found not guilty. 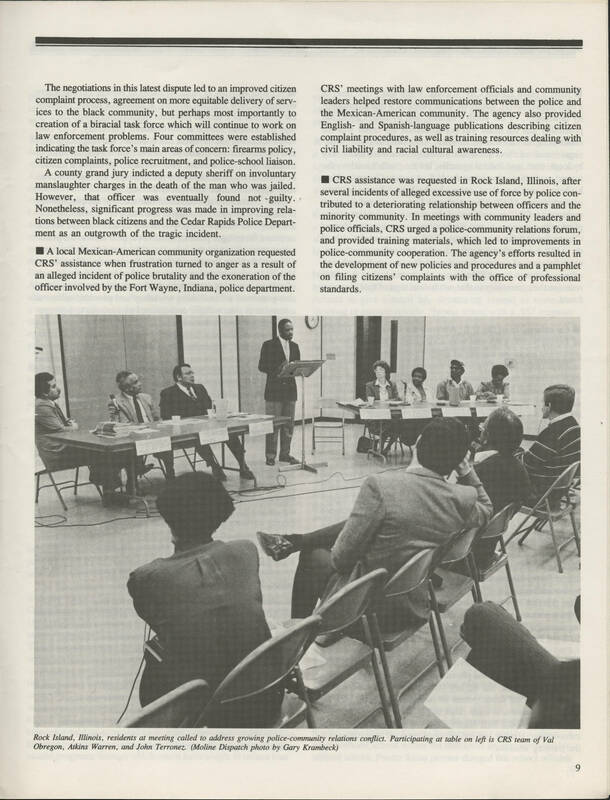 Nonetheless, significant progress was made in improving relations between black citizens and the Cedar Rapids Police Department as an outgrowth of the tragic incident, A local Mexican-American community organization requested CRS' assistance when frustration turned to anger as a result of an alleged incident of police brutality and the exoneration of the officer involved by the Front Wayne. Indiana, police department. CRS' meetings with lawn enforcement officials and community leaders helped restore communication between the police and the Mexican-American community. The agency also provided English- and Spanish-language publications describing citizen complaint procedures, as well as training resources dealing with civil liability and racial cultural awareness. CRS assistance was requested in Rock Island, Illinois after several incidents of alleged excessive use of force by police contributed to a deteriorating relationship between officers and the minority community. In meetings with community leaders and the police officials, CRS urged a police-community relations forum, and provided-community cooperation. The agency's efforts resulted in the development of new policies and procedures and pamphlet on filing citizens complaints with office of professional standards.